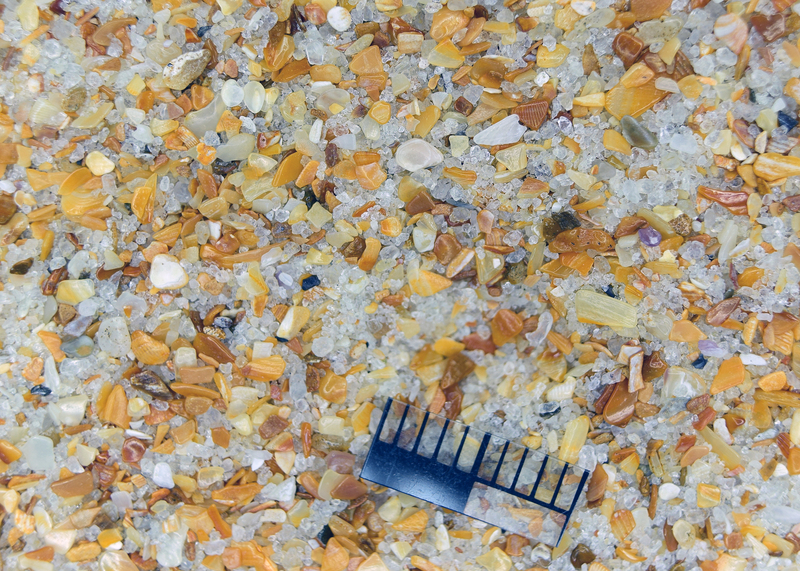 This sand from Flagler Beach, Florida, contains both mineral grains and shells. 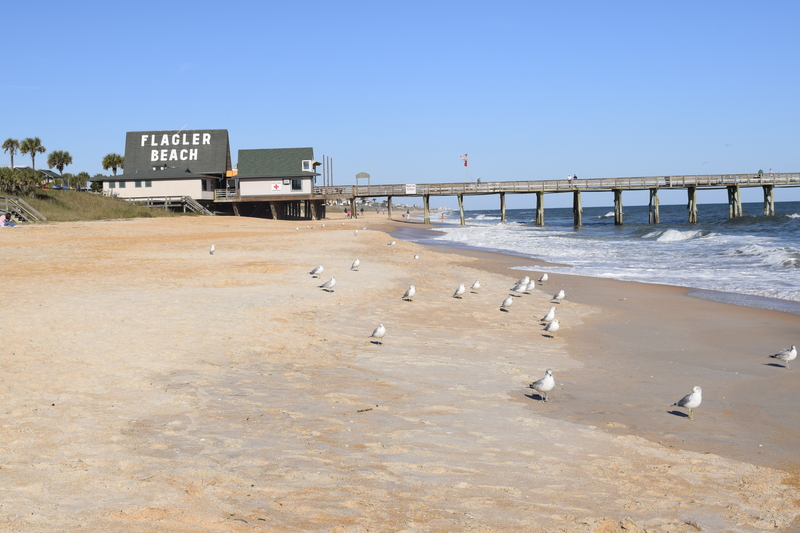 The mineral grains are clear quartz, and the brown, tan, and orange grains are shells that give the beach an orange hue. Blocks of coquina (roughly 130,000 -100,000 years old and known as the Anastasia Formation) are found offshore much of eastern Florida and in various locations onshore. Erosion of submerged coquina rock formations contribute the colorful shell fragments to the beach sand we see at Flagler Beach today. The Florida coquina consists of shells and quartz sands that were deposited underwater thousands of years ago and then cemented together during the last ice age. During that time, ocean levels dropped, exposing the deposited sands and shells to dry air and rain. Rain water percolated through the rock layers and broke down the calcium carbonate shells, forming carbonic acid that settled to the bottom of the porous layers and cemented the loose material together. Coquina blocks from onshore deposits were used by the Spaniards in constructing forts as they were soft enough to quarry and strong enough to withstand cannon shots. The Castillo de San Marcos is one famous coquina stone fort. It was able to withstand two English sieges in the seventeenth Century thanks to Coquina’s unique ability to stop canon balls. The soft stone absorbed much of the force on impact like a sponge, so the canon balls would either lodge themselves into the coquina or simply bounce off. Either of these options are preferable to shattering, as walls made of harder stone would under canon fire. The fort was famous for being almost indestructible and managed to keep the British out of Florida until the Treaty of Paris was signed in 1763. All sand, regardless of where it’s from, has a cool story to tell. Whether eroding from an ancient mountain range, or a cemented pile of dead mollusks, every grain has a journey to make before it gets to the beach. And this is just one example of all the amazing stories waiting to be discovered in our microscope lab at HMNS Sugar Land. We also explore the plant and animal world, and even take a super up-close look at some commonplace objects you can find around your house. It’s amazing how many tiny wonders lie all around us, just beyond our ability to see. Come look through a microscope and find out for yourself!